"..I wish the run good would have lasted just a few more hands but I was fairly happy with my play, which doesn’t happen very often, so I wasnt too disappointed. That's really what it comes down to for me: if I feel like I've played good, I'm not going to be upset." Have you had time to explore the new RKH feature - HeroScore, wich is essentially a ranking that measures not just results, but also contribution and popularity? Anything that you found surprising, interesting, disappointing?.. I've explored it a bit but haven’t completely updated mine yet. I find the idea pretty cool and fun even though I don't really like the "brag" side of it. To some extent yes, but I feel it's true for anything in life. If you care about the game and it's growth, you should try and contribute obivously but if you've worked very hard to become good and make a lot of money and don't feel like you owe anything to anyone in the poker world, I think that's fine too. I'm sure a lot of players feel that way (Daniel Colman comes to mind) but they still want to have a positive impact in others aspects of life. In what ways (if at all) are sport stars and Hollywood celebrities better ambassadors for the game than pros? In what ways (if at all) are women better ambassadors than men? Sport stars and Hollywood celebrities can bring new players to the game and the same goes for women since still very few women play poker or give tournaments a shot. 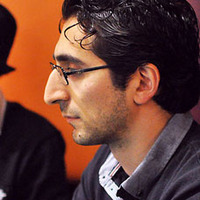 Pros can be useful to attract people who already play to an online site. You see someone like @Jason Mercier winning a bunch of SCOOP events on Stars and you might want to do like him but someone like Neymar can bring soccer fans, people who've never played poker online or even with friends, to the game. 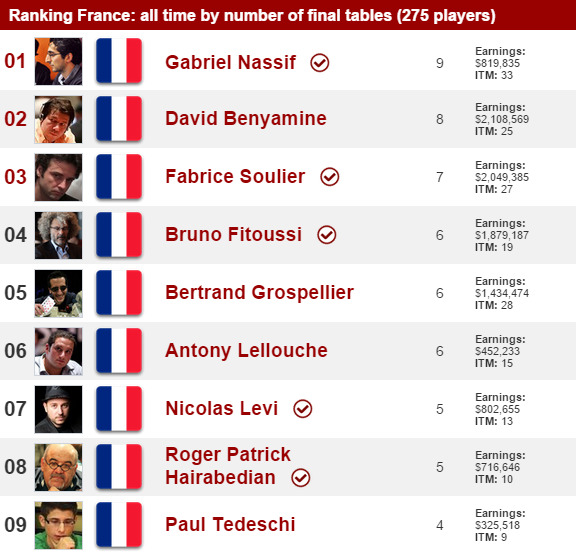 Right now you are on top of several French poker rankings with your overall WSOP performance (by final tables and by ITM finishes, for example). Which achievement / record would you rather have in your own resume - Hellmuth’s 14 bracelets, Sklansky’s best-selling books, or Negreanu’s all-time live earnings? I think it's pretty close between Negreanu's and Hellmuth's records but I'd probably pick Daniel's. Sklansky's is a very distant third even though I am grateful for the books he's written since they were probably the best learning tool available when I started playing. Any important lessons learned for this year? I still feel like I don't bluff enough in the NL tournaments. A lot of players play too loose and you can really put a lot of pressure when you know they have a weak range but it's something I have trouble doing. I usually know what I'm supposed to do but I just can't pull the trigger when I need to. I'm also a bit sad cause I feel like I've fallen behind in the mixed games. There's still a lot of dead money but the best players, who get to play all the games on stars.com or in live cash games, are so much better then the rest of the field that it's hard to have an edge. I was planning on playing the 10k 10-game mix event but I think I might stick to Limit Hold'Em and PLO because I'm too rusty in the Stud and Triple Draw games. How do you explain the appeal and ‘magic’ of the WSOP and how important do you think Vegas is to the experience? I think it's the people that show up that make it special. The fields and the prizepools are huge, and almost all the best players come to try and win a bracelet every year. Even players who might make more money playing live or online cash games want to win a bracelet, someone like @Alexandre Luneau last year or @Douglas Polk this year. Those guys have won millions and they're battling in $1500 events in which their ROI is way less then what they can win in a good cash game session. I don't think that Vegas and what it offers has much to do with the WSOP's magic, it just happens to be the place where it all started and it became a tradition. 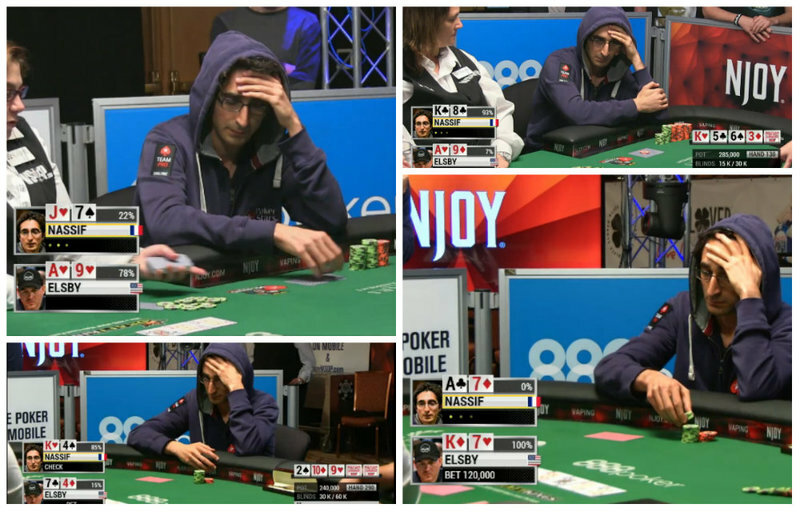 How do you feel when the WSOP ends? Any tricks or ‘ritual’ you’ve developed to help you ‘go back to normal’? Well it usually ends when I bust the Main Event so it's never very fun but even though I love the WSOP, I'm happy to be back home after being away for two months. Sometimes, I take a short vacation and if not I'll take a few days off poker before getting back on the grind. 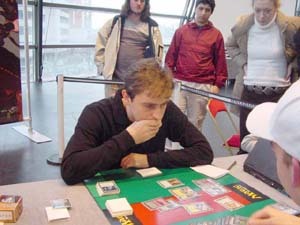 You are a hero of two games and their respective communities - poker and MTG. Have you ever been tempted to take up competitively another game or sport? 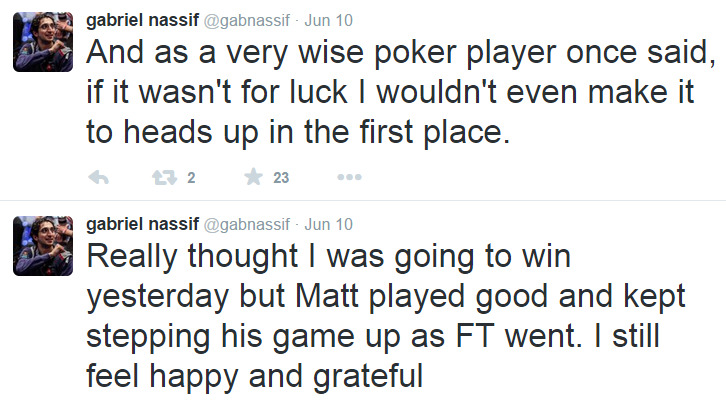 How has Team MTG been doing in the 2015 WSOP so far? I don't think any mtg'ers have won a bracelet yet. I have a second, so does @Brock Parker and @Bryn Kenney but people like Efro [@Eric Froehlich] , Williams [@David Williams] , Ike [@Isaac Haxton] or @Scott Seiver haven’t played a ton of events. I hadn’t thought about that. All things considered, I was happy with my second place finish. I wish the run good would have lasted just a few more hands but I was fairly happy with my play, which doesn’t happen very often, so I wasnt too disappointed. That's really what it comes down to for me: if I feel like I've played good, I'm not going to be upset. Thank you for the interview, Gabriel, and GL in the 10K!!! You must be logged in to post comments and participate in the discussion. This email is in use. If you are already a member of RankingHero.com please use your account to log in!